Before launching his 2016 presidential bid, Donald Trump was known for a lot of things: his real estate empire, his many golf courses and hotels, his steaks, and, of course, his reality show. 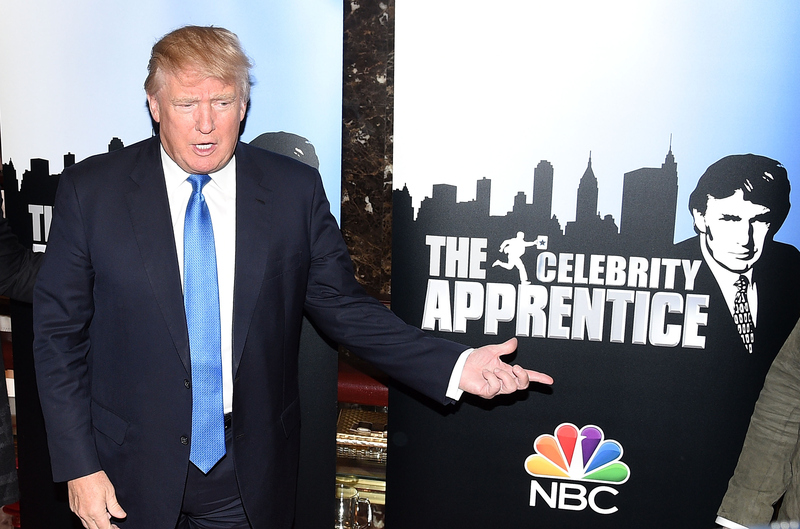 In 2004, Trump began hosting The Apprentice, a classic mid-aughts reality show where contestants sought to be Trump's business apprentice. Trump, whose recent media experience before his presidential campaign was mostly through the lens of reality television, has often been criticized for his irreverent, outlandish campaign. But instead of — or in addition to — running for president, could Trump be trying to produce The Apprentice from the White House? At least one person seems to think so. On a recent episode of WNYC's The Takeaway, which aired on Friday, Aug. 19, host Todd Zwillich suggested that Trump's recent embracing of the alt-right media — at a time where securing support from moderates is critical — suggests that he "may already be thinking about the day after the election" and is trying to create a "new right-wing media empire." It's no secret that Trump and his supporters are, at best, wary of what they call the mainstream media — the Republican candidate's campaign has repeatedly claimed that there is clear media bias against Trump. In June 2016, Trump announced that Washington Post reporters were barred from his campaign events — reporters from the Post joined the ranks of staffers from Univision, BuzzFeed, The Daily Beast, The Huffington Post, and POLITICO, which are all on Trump's media blacklist. Could this distrust of the media be indicative of a larger Trump plan to create his own media company? "There have been discussions about this, so this is not just something that we have been thinking about in the media," Sarah Ellison, a contributing editor at Vanity Fair told Zwillich. "This is something that Trump and his son-in-law Jared Kushner have had conversations about: how would you monetize this audience?" Ellison made some salient points: Trump and Kushner refer to their electorate not as constituents, but as an "audience." "Trump doesn't distinguish between what an audience would be, that you could actually monetize, and what the political electorate is that would go out and vote for someone." However, Ellison said she doesn't think this has been Trump's plan from the beginning. "I think ... once he started to get some success in his primary campaign, people around him said, 'Well, could we make some money off of this?'" That's a convincing argument, particularly since Trump has spent the entirety of his campaign positioning himself as a shrewd businessman, a direct contrast to Washington's bureaucracy. However, besides being on The Apprentice and giving interviews, Trump doesn't have a considerable amount of media experience. Enter Stephen K. Bannon, executive chairman of alt-right news and opinion site Breitbart News, which has essentially served as a propaganda machine for Trump's campaign since he announced his candidacy. Trump recently appointed Bannon as his campaign's chief executive. As Zwillich and Ellison pointed out, Trump's appointment of Bannon may not be an olive branch to moderates and establishment Republicans. Instead, Trump's appointment of Bannon could be either an attempt to shake up a faltering campaign or an attempt to create a contingency plan in case Trump loses — or even both, at the same time. Trump discussed continuing a version of The Apprentice from the Oval Office if he were to win the election November. "The idea was that you couldn't do it during the campaign ... but once you were in the White House, it's a possibility. You could certainly do it from there. So then we really would be living in a sort of Truman Show reality," Ellison said on WNYC. On Sunday, Aug. 21, Bill Kristol joked about Ellison's claims via Twitter. "I've spoken with [former CIA operative and current #NeverTrump candidate Evan McMullin] and he says he'll consider Trump's request to film there," Kristol wrote. From the looks of it, however, it's far too late for a McMullin takeover. If there's anything Trump has proven, it's that there's a loud, vocal percentage of the population for whom Fox News is not enough. They either want victory, media affirmation, or both, and Trump wants to give it to them.